What if job postings could return high-quality candidate results while eliminating an entire, challenging step of the hiring process? And what if it cost less and worked better than the process that you use now? Matomy Media Group found out that RealMatch / AppMatch does exactly that. It's an efficient, affordable talent acquisition solution that's fast, concise and automated. That's a lot of adjectives. But then again, AppMatch is powerhouse technology. Alexandra Bautista, human resources director for Matoma Media Group, is busy enough with day-to-day operations. Her duties include payroll, benefits, employer relations, and of course, talent acquisition. With the company's fast-paced growth, hiring is a top priority. Bautista posted job ads through traditional job sites, the same way that most companies do. And the results were fruitful. But there was one significant problem: so many candidates applied for Matomy job postings that sorting the wheat from the chaff became yet another time-consuming role. To compound the problem, Bautista's staff didn't have the right experience to help share the workload of sorting through applications. It was time to try something different. Bautista elected to try AppMatch, which is a boutique-style talent acquisition service. For many companies, it's the perfect balance between no-fuss results and affordability. First, the job description was optimized to improve candidate response. Then AppMatch started a job ad campaign across thousands of leading job platforms. 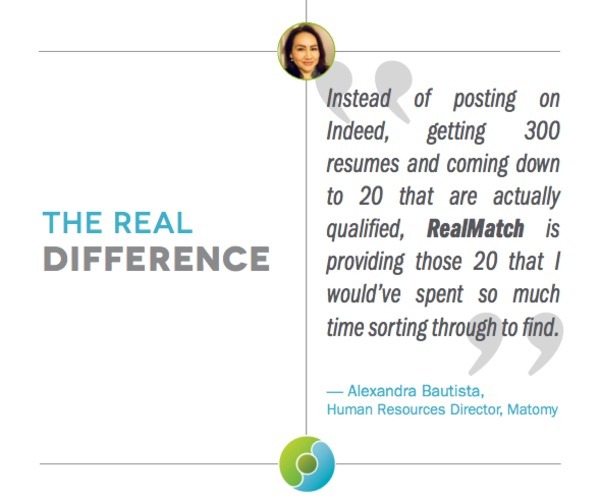 When candidates applied for the job, RealMatch technology jumped into action, performing the screening process that Bautista used to tackle manually. The last step in the process was an inspection by the RealMatch performance team. The list of applications was trimmed down to the very best matches, and all that Bautista had to do was review those top-matched choices. After job ad optimization, the volume of applications increased by 26 percent. But that didn't compound Bautista's problem, it helped it. Through the AppMatch process, 47 percent of those applications were automatically screened out. With more qualified candidates reached and more applications submitted, the quality of applications improved. The same number of likely made it through the screening process as would have before the ad was optimized. But with a larger pool to select from, Bautista was returned top-shelf talent. Matomy's cost per qualified application was about $45. The company saved $5,639 by using AppMatch's promise to only deliver and bill for the best-matched applications. HR is a busy job under the best of circumstances. When you add the complexity of a growing company and high demand for the best available talent, most directors would need a strong staff of skilled and experienced professionals to keep up with the applications. AppMatch can do that for you at an affordable cost. Are the details of hiring getting you down? Is there no room in the budget to hire a staff to help with applicant screening? RealMatch AppMatch could be the solution that you've dreamed about. 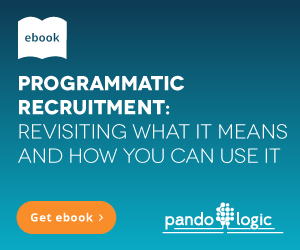 Learn more about our approach to talent acquisition and keep up with the latest trends. Subscribe to Recruitment ADvisor and get timely articles delivered to your inbox on the regular.